I had been interested in seeing this, but somehow never got around to it until this weekend. I had heard about Nicky Barnes and Frank Lucas when I lived in the Bronx. It seemed like every dope fiend had an opinion about who was the better businessman and who was nothing but a snitch. There was so much talk I hadn’t realized these guys were gangsters from the late 60s and early 70s. Although it’s a true story, somehow the movie doesn’t seem to come together well. 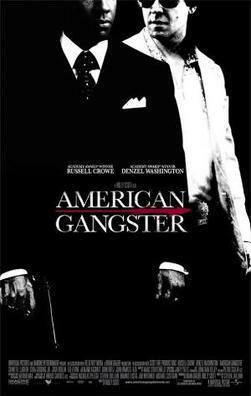 Lucas (Denzel Washington) is a smooth character, especially in contrast to the plodding Roberts (Russell Crowe). Lucas is held up as an icon of black entrepreneurial skill, despite being a gangster. I am used to movies with a bad guy that you sympathize with, but Lucas doesn’t really get a sympathetic treatment. He just is what he is. Roberts comes off like a mope. Not sure what to make of it all.